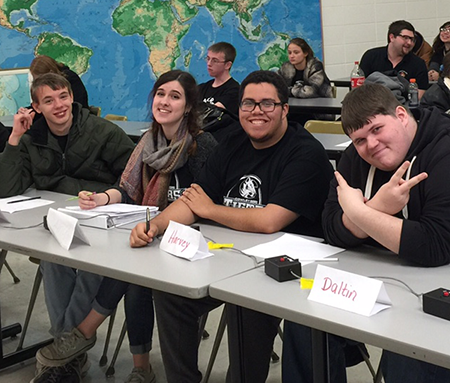 Cowley College’s Academic Excellence Challenge (AEC) A team, made up of Garrett Misora, Amy Austin, Harvey Baker, and Daltin Brock, have been invited to compete at the National Academic Quiz Tournament (NAQT) having earned a D-value score that ranked them among the top 24 teams in the nation. The Cowley A team will be competing with teams from Alabama, Florida, Illinois, Mississippi, and Tennessee in Atlanta, GA on February 25-28. Cowley A was ranked 15th out of 61 community college teams. Austin is the only returning member from last year’s A team that placed 15th at nationals. Four other teams from the Kansas region will be joining Cowley’s A team at nationals. Redlands A is ranked second; Johnson County A is ranked seventh; Cloud County is just behind Cowley at No. 16; and Johnson County B is ranked 17th. AEC sponsors Dianne and Mark Flickinger will accompany the team to nationals. Cowley A team members are, pictured from left, Garrett Misora, Amy Austin, Harvey Baker, and Daltin Brock.